RAMBRANDT ON ALFA ROMEO …. That´s all , as you can see , verry simple. ok….now to the Subject ! They are different but share the same Idea , simple , symbolic and plain on black Background. SALUT to Apples IMovie built in Effects 🙂 !! Simple stuff works always best ! It´s hard those days to come up with an idea nobody has. That´s Life ! Good Work though…. lost in my Lab ! long time no C !! I was quit busy here, my Lab is burning right now !! I´m in Research for some brutal and controllable Sounds and found some devices i can work with. It takes a while to go thru the Manual but i have to take the Road since i create my Sounds always myself. It´s like having a Porsche hidden in your Garage and don´t know how to Drive ! 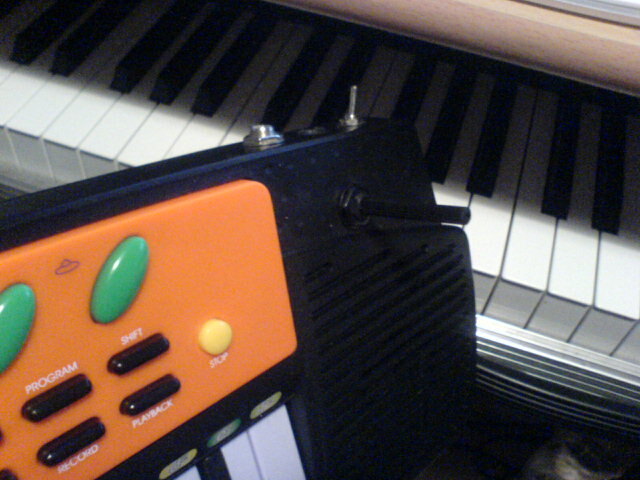 I did some Circuit Bending too on a cheap 15€ Keyboard from Toys R Us , that thing is screaaming like hell, turned it into something brutal, i call it ” BILLIGSÄGE ” ! I will use it on the follow up i´m working on right now. My 2 C64 II Computers are under serious maintenance , Circuit Parts getting replaced and some useful Outputs added so that this Machine is ready for 2009. No unwanted Noise ! Sitting also on a Remix for an american Act + it looks like RAMBRANDT goes Collabbooo with ADLER ! Let´s see what comes out when some Brutalnessmess comes together and make some serious noize !!! Greetings from the 8bit Island ! When i was on tour with a broken Beat act in japan , i..ve used Ableton Live for the first time and on stage and we didn..t had actually a Headset for Comunication so i had to wave arround with my Arms/Hands and shout 1 , 2 , 3 , 4 .. to count-in the next Parts in the Song Arrangements ! After a while the Audience thought they had to follow my counting so they started shouting : 1…2…3…4 too ! I was suprised ! While doing ” ALARM” ! i remebered that gig and i thought why not putting that one in ……whith a robot voice ?? Yesterday i was at the foo club in Hamburg ,my buddy..s from Saint Pauli played the Song and i saw for the first time how geat the Reaction was…..i was happy! Even the entire DJ crew screamed : 1…2…3…4 and kept that for other songs as well ! ALARM! get´s overall positive Responses ! ” Alarm! ” gets overall positive Responses from all over the World .Dj´s are plaing the Track now and i´m really excited about their responses that the crowd literally freaked out when they heard the track ! If Rambrandt’s goal of “Alarm!” was to melt faces, I’d say it was pretty successful. Besides the delicious 8-bit breakdown about half-way through, its basically a dance-floor killer; literally and figuratively. I could see a “Boys Noize” crowd eating this one up. One of my brothers (yes we still say “brothers” to our friends, cause we’re all only children) sat in the kitchen today, when I started to spin this track. He suddenly fell off his chair, stood up, sat down again, fell again, stood up again, sat down on his chair, fell off it, stood up, sat down on his lovely chair, fell off it, stood up nerved the fourth time, sat there a minute, fell off rough again, broke his right hand, stood up again wordless, sat there, dropped off his chair like a loser, stood up again, sat on his chair, that I bought last autumn, rested a second to finally fell down again. Only because I pushed the new Rambrandt. ALARM! .. Dette er noget helt nyt og det er netop landet i vores mailbox. Vi ved ikke meget om personen der står bag det, men det bliver det jo ikke mindre fedt af. Vi ved dog at han hedder Dezzo, er 31 år og er bosat i Tyskland. Han er en del af et producer-team, som har arbejdet meget med hiphop og R&B. Desuden er han professionel trommeslager, hvorfor han også kommer en del rundt i verden, da han turnerer meget, med forskellige artister og bands. Sidst men ikke mindst, så laver han også elektronisk musik. Dezzo fortæller, at Rambrandt repræsenterer hans lidt hårdere musik. Lige nu har han kun ét track fra Rambrandt-sideprojektet, men det beskriver han som værende en meget speciel sammensmeltning af punk-rock og Commodore 64 8-bit-lyde – en rigtig spændende sammensætning. Vi glæder os til at høre mere fra Rambrandt i fremtiden. Her er hans første track. Hop desuden over på hans MySpace og giv ham lidt virtuel kærlighed. Now for something completely brand spankin’ new… this coming from Rambrant via my inbox (in full 320 kbs glory (how does that work when it’s 8 bit to begin with?)). Anywho, dont know too much about him other than he claims to be from Christmas Island, but with a track and myspace full of German influence… meh I’ll hold judgement. Just enjoy the track. FIRST UP. An awesome track by Rambrandt that i found on Data Sapiens. Sounds kinda like Slagsmålsklubben remixing Bloody Beetroits. Or like if Boys Noize was making music using curcuit-bent-supah-nintendos. Were so gonna play this at our next DJ-set! Oh! And it´s his 1st track ever. Props 2 Rambrant! Applauses all around!! ALARM UP MY 192 SATAN MESSIAH. ok ? Tout simplement mes quelques sons du moments, ceux qui tourne dans mon ipod, donc pourquoi pas dans les votres. [ARTEM LOVES ! ] Rambrandt – Alarm! Vive l’art, vive Rambrandt, petit message perso: JE T’AIME. The robot movement is something very unique to electronic music. Without the presence of live instruments (for the most part), artists have been using the bleeps and buzzes of their music to their advantage, developing their lyrics, beats, and even images with a serious robot influence. Doesn’t hurt that the pioneers of this movement are actual robots, the men more commonly known as Daft Punk. Some of the biggest names in the industry have made their mark with this sound, and I’ve linked some of the big ones below. Everyone from Justice to MSTRKRFT keeps the party going with their own form of robot rock, and some of these tracks are the ones that got me into this music in the first place. Thought I’d show the old-school songs some love, and throw in a new banger mashup, Phantom Robot by McMaxx, a dirty Belgian DJ. Keep in mind, some of these are serious bangers that will blow your ears off…proceed with caution! Honestly I know nothing about this guy, but his track ‘Alarm!’ has been in my setlist for months now…and ismy favourite song of 2008. Dans un style plus barbare, toujours en provenance de l’Est,Rambrandt nous délivre un morceau 8-Bit sans concession. Fidgeténervée. For an ordered and diligent nation the Germanic people have been known to dabble in the extreme. In 1923 they produced the first ever rear mid-engined rear-wheel drive Formula One car. That is pretty extreme. So is this song. RAMBRANDT Elektro 8bit Project !